Wincomm is one of Taiwan’s leading manufacturer of industrial computer and embedded computer products. Wincomm designs and develops all-in-one panel PC, large size all-in-one digital signage system, rugged box PC and embedded software products for a broad range of industries and applications. Wincomm aims to provide hardware and software integrated solutions for the most variant environments such as industrial automation/ human machine interface control, digital signage / infotainment Kiosk, and medical computing. Wincomm has proven its outstanding reliability with Australian digital signage installations such as the Val Morgan Advertising network used around Australia. 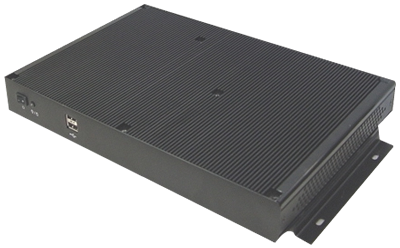 The Wincomm digital signage computers are an industrial grade design that provides longevity, reliability and if required, parts back up. The designs are suitable for rack mounting, wall mounting, installation behind screens, desk location or will meet other requirements if needed. The range of Wincomm Digital Signage computers allows you to select a model that is suitable for your requirements, whether it is high power, or fanless, a suitable and reliable solution is available for your digital signage requirements. Intel X2Q/C2D Signage Player PC. Rack mount chassis form factor with 1RU height. Intel high performance Core 2 Duo and Core 2 Quad processor. Mainbord design with Intel Q35 + ICH9 chipset, 1333MHz FSB & socket LGA 775. Extra add-on options of wireless LAN kit and rack-mount kit. Intel Pentium M 1.8GHz processor. Mainbord design with Intel 915GM + ICH6M chipset, 533 MHz FSB & socket 479..
1GB maximum memory for dual-channel DDR2-533 DIMM. Extra add-on options of graphics card, wireless LAN kit, dual LAN card, TV/video capture card and rack-mount kit. Fanless design for up to 40 degree C ambient operating temperature. Ultra compact A4 size dimensions with only 38mm height. Rugged metal housing with external fin-like heat sink top and bottom cover. Integrated high performance ATI Radeon HD3200 graphics core with sideport memory. Mainboard design with AMD 780E + SB710 chipset, 800 MHz FSB and socket AM2. 3GB maxijum memory for dual-channels DDR2-800 SODIMM. SATA II HDD and optional HDMI output. Extra add-on options of mini PCI-e wireless LAN kit. Smart fan design with variable speed control.